Let us consider the development of a population whose members live, give birth to a finite number of new Individuals, and die. Reproduction and death are properties of all biological populations including demographic and cell populations (see Jagers. 1975, for example). Other examples are the development of families of neutrons in atomic reactors (Vatutin et. al., 1985), the behavior of cosmic ray showers, and the growth of large organic molecules (Uchaykin and Ryjov, 1988; Dorogov and Chistyakov. 1988). All of these processes are characterized by the sane property, namely, their development has a branching form. 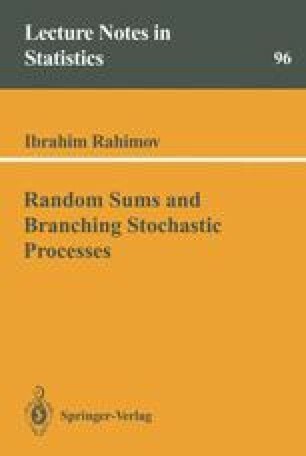 A branching stochastic process is the mathematical model of such kinds of empirical processes.